The children looked at one another. Strange things were happening. Mom, who never went anywhere, was going away. Dad, who was almost never at home, was coming. The children, who had never been left alone, were about to spend the night on their own. And in the hall closet slept a trained monster, though everybody had always been told that monsters didn't exist. It is the beginning of school vacation when Mom gets a letter telling her she has won two weeks at a spa in Lapland, and since her husband is working abroad, the prize includes a trained nanny for her three children. The Hellman kids, Halley, eleven, Koby, nine, and Mimi, six, are secretly delighted at being on their own when Dad (whom the kids have named The Invisible Voice because he's always away) phones to say that his plane has been grounded because of a freak snowstorm, and the kids are confident that they can carry on just fine until he arrives. At the door stood a brown-black creature. It was big and wide. It had two enormous feet and two enormous hands. In one hand the creature had a crumpled scrap of paper. "This must be the instructions," Halley said. The instructions describe their nanny as a "half-human, commonly known as a monster." Their monster, named Grah, has a faint woodsy smell and appears quite dusty. However, she washes her hands diligently while she prepares very large and peculiar sandwiches, watches television between meals, and sleeps quietly, standing in the hall closet. Otherwise, the children seem to be free to do as they please, and it looks like this is going to be the best holiday ever. When they discover that some of their friends' mothers are also away at the spa, also leaving them in the care of monsters, Koby has a brilliant idea. All the kids with monster nannies can set up an open-air camp beside the lake. They put up their tents, pool their boats and water toys, and, with their monsters providing elaborate picnics, they soon have the best summer camp imaginable in full swing. But there is trouble in paradise when some townspeople spot the monsters foraging for their diet of rotted leaves in the forest, and soon the local citizens seem to be mounting a monster hunt straight out of Frankenstein. The Hellman children and friends realize that to save their kindly monsters, they must find a way to help them find their way back to their underground home. 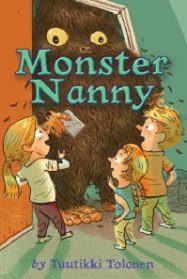 And Koby just happens to have a book, the only monster book in the town library, to show them the way, in Tuutikki Tolonen's forthcoming Monster Nanny (Houghton Mifflin Harcourt, 2017). Author Tolonen's tale takes place in the modern scene, but has an old-fashioned tone, straight out of the world of Pippi Longstocking, with overtones of Roald Dahl's Charlie and the Chocolate Factory and the more recent Lemony Snicket's Baudelaire kids' The Bad Beginning: Or, Orphans! (A Series of Unfortunate Events, Book 1) and Jeanne Birdsall's The Penderwicks: A Summer Tale of Four Sisters, Two Rabbits, and a Very Interesting Boy. The unflappable Halley, the resourceful Koby, and the self-possessed Mimi, inspired by her talking blue bathrobe, have the right stuff to be perfect fictional friends for a home-alone school holiday. The Hellman children's monster, Grah, is far from a Mary Poppins, but in that honored tradition of children who find fantastic adventures just beyond the purview of parents, this one is right on target to enchant middle readers who dream of summer fun during these long winter nights.